Here I am in Costa Rica on the medAge challenge with Dr. Laura Ellis. My challenge was surfing for the first time in my life, which has gone delightfully well. I owe much to Dr. Ellis and Trina for getting me ready for this endeavor. The second day of surfing still brought butterflies to my stomach. This surprised me since I had done well the day before and now knew clearly what I was up against. As we head out into the surf, I tell Alain how I am feeling to which he chuckles and reassures me I will be fine. He was right! He confidently decided to have me ride bigger waves by going farther out. The distance made for a longer ride and gave me a chance to connect more deeply with the experience as a whole. Alain stayed out in the waves while I rode in and I was able to paddle my way back to him. 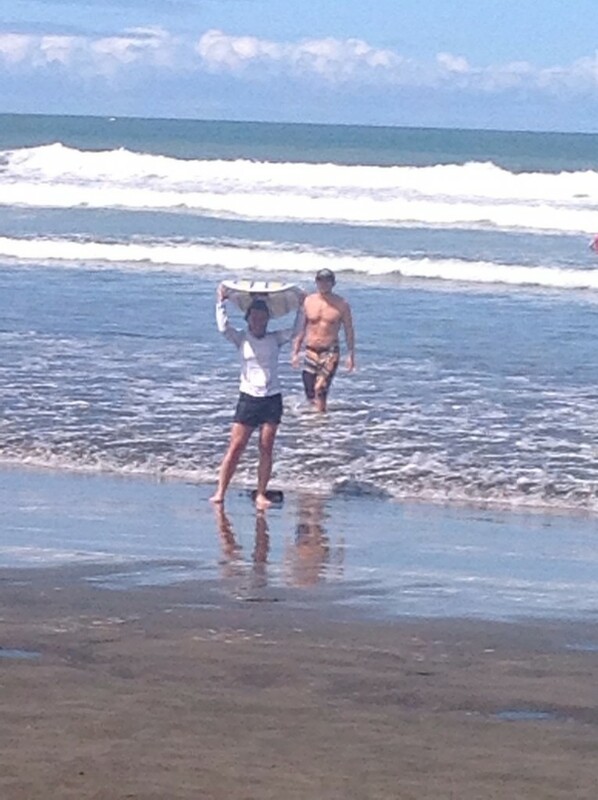 This meant I was only relying on him to keep me out while the huge waves crashed down on me waiting for the right wave. Without him, the power of the ocean would have easily washed me back to shore like a leaf. It felt powerful to paddle myself back out through the surf knowing that is the hardest part of the endeavor. Proud is too small of a word to convey my feeling in that moment. My surf morning ended with me getting silly and meeting a different goal. Having found my balance and security on the board, I playfully “flashed” my bikini top to my crew on shore which was under my surf shirt. My goal for the day was accomplished! Our time here has also been filled with experiencing local culture; my favorite traveling thing to do. A visit to the local market gave us an opportunity to see, touch, and taste local produce, baked goods, and cheese. To wander through this outdoor weekly market gives you a sense of being ‘local’ with the true locals being very friendly and welcoming. My favorite cultural study came at a surf competition we attended in Playa Hermosa. We traveled to this neighboring town on a Saturday to sit at the local beach bar, “The Backyard” and watch 20+ surfers compete. They were all young and mainly true locals. We had heard the politics of the competition precluded certain people from entering. This was for a particular genre of surfer. In a rustic setting with weather worn wooden tables and chairs around the open air bar and scattered around the beach, over 150 people eventually gathered to watch the show. No one could be disappointed to see these young men riding 10-12 foot waves. Riding through tunnels of water, wiping out on peaks of waves, boards popping up out of the water before the rider surfaces made for an exciting show. Having had my own experience, even if a beginning one, made watching them all the more real. During the competition, I wandered the beach and breathed in the sense of community that surrounded me. People sitting in large groups, taking pictures with each other, dogs running all about, children being tossed into the air and played with, as the setting sun cast a surreal golden glow over everyone. The overall feel was bohemian and dream like at the same time. Every local I interacted with was eager to connect, gracious, and kind. While this community is small, it does not exclude those who are genuinely there to share in the experience. Today brings a new challenge for us, waterfall repelling. This will another first for me and somehow my nerves are much less knowing we are all doing it together. I am eager to see and experience another eco-system in Costa Rica and share the adventure with you when I blog tomorrow!